Here is "TOP" No. 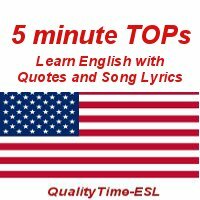 9 to help you to understand spoken English through "Training with Oral Practice" with famous quotes and lyrics. Click on one of the icons below to get the recording or go to the iTunes store to subscribe and just type "Marianne Raynaud" in the search window. Below we tell you where these quotes and lyrics come from, but do the exercises first! For the transcript: Go to the store where you will find a pack of transcripts for TOPs 1 to 10 (including the oral tests) for a minimal price. If you want to go on, TOP 10 is now available. You can also work on our previous episodes. If you want to know what songs we referred to, here they are with links to videos. Enjoy! And practice! Time of My Life (excerpts from the film "Dirty Dancing"
If you are looking for effective teaching materials, read about QualityTime-ESL: The Digital Resource Book Version 5.0 on a DVD with 3.9 GB, which includes all the recordings, scripts and worksheets of our different series plus 1,300 other files (MS Word, MP3, PPT and video). To purchase it for €29 plus shipping according to the destination, just go to the store.